something new with. People are eager to do something new with their master bedroom, and it seems like every kitchen goes through at least one kind of renovation. People are more than happy to experiment with a few Persian rugs in the dining room and a new color scheme for the family room, but there's one room that's always overlooked: the bathroom. Every bathroom mirror doesn't have to double as a medicine cabinet. If you want to spice up your bathroom, try picking up a bold new decorative mirror. Along with the sink, tub, and toilet, the mirror is one of the most visible pieces of your bathroom. Making a change to it will be enough to spruce up your bathroom. Lighting is an essential tool for every interior decorator. Lighting helps set the mood for the room, and you can easily make some décor changes to your bathroom by changing the lighting. You could try to install a dimmer switch in the bathroom, or you could install a hanging light fixture or chandelier to add some class and personality to it. Your old medicine cabinet and toilet shelf are essential items for your bathroom, but they may not do much for the current décor scheme. 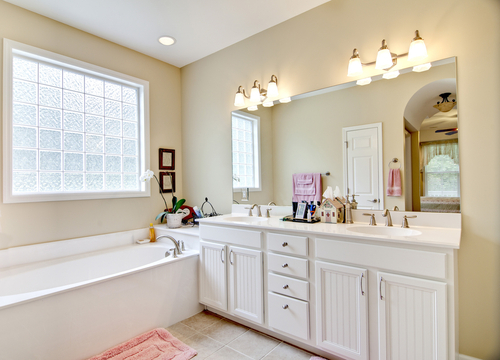 If you want to change the look of your bathroom start with some of your storage space. Try picking up a new shelf or even a wall shelf. If you want to save money, paint over your old cabinets with an eye catching color.